Personal testimonials and relationship building have been equally important in positioning BioZyme® products to customers for one novice dealer in southeast Iowa. Cecil Reed, who became a dealer in January, says the fact that she and her family have had personal success using various BioZyme products helps her marketing strategy. The producers in her area build a stronger trust factor when they hear about her personal experiences, and that helps build relationships and sell product. “Once the growers know that I have had success using the products on mine and my family’s operations, I find out the grower’s goals for their operation and suggest products with their goals in mind,” Reed says. The marketing tools that BioZyme provides allow Reed to back up her testimonials with research and product facts, which help position the products. She has posters and brochures grouped by product lines in her office, and she carries literature in each vehicle so she has something to put in front of potential customers, giving them something to read and think about after she leaves. She adds that direct mail is part of her future marketing plans since so many producers in her area still rely on the written word. Reed grew up near Bloomfield, Iowa, on her family’s diversified farm that included cattle, row crops and a sheep flock that allowed her and her sisters to show competitively at the local, state and national levels. She graduated with an agronomy degree from Iowa State University in December 2014 and within the next year married and started her business, NexGen Ag Solutions. In addition to selling BioZyme, Reed also sells Pioneer seed. 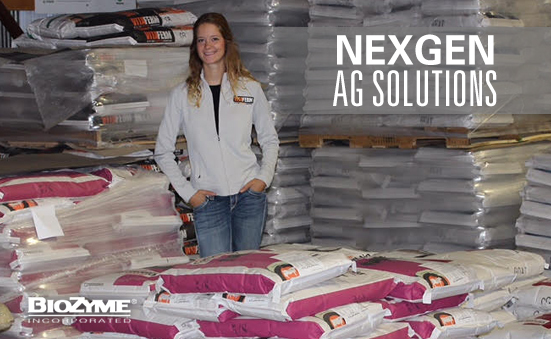 “Adding value to your farm” is the tag line for NexGen Ag Solutions, and carrying value-added products for the producers in her area is important to Reed. With producers watching their expenses and questioning the prices of BioZyme products, Reed can share her personal success stories. She says her go-to message is the “Amaferm advantage” because it does increase digestibility, and in her area where forage quality isn’t superb, this message really hits home. Another testimonial she shares is for Vita Charge® products, especially Liquid Boost®. She says her dad treated a freshly-weaned lamb crop that went off feed with these products, and he witnessed immediate results when they started eating again the next day. Reed said her dad was sold on the products. “The products are simple to use, and yet cover a diverse audience,” she says. She said after attending the recent dealer retreat in June, she was impressed that the same HEAT supplement works for producers in the extreme heat of Louisiana and other Southern states. When she shared those endorsements with her own customers, they were convinced that the product would work for them, and it has. Reed has been aggressive in sharing her vision for the products. She has a business Facebook page, where she shares information with customers and potential customers, has used radio advertising and newspaper articles to inform growers that she is a dealer and talks one-on-one with people in her area. She is sponsoring awards at the Davis County Fair – a bag of Sure Champ® – for the grand champion overall steer, heifer, wether, ewe, barrow, gilt, buck and doe. She also plans to have a hospitality area at the fair with cold drinks for the exhibitors where she can talk about BioZyme and its products. She says in the future she would like to host producer meetings to educate producers as well as exhibitors and their parents of the benefits of various BioZyme products. Reed plans to use the CONNECT Online store more heavily in the future. She predicts that CONNECT will benefit her Vitalize® horse customers since many of those products have a lower feeding rate and are not reordered as often, as well as assist her with inventory control. Cecil Reed is a true believer in the BioZyme products and the differences they make in livestock. With her winning attitude and belief in the product, she has positioned the products in the spotlight for many producers in her area. “As long as I build trust with my customers, and trust helps build relationships, it is easy to position the products,” she says.